We perform a variety of both elective and non-elective surgeries. 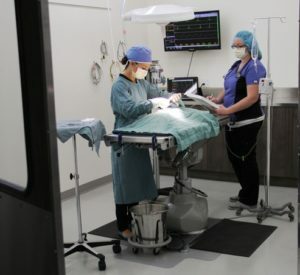 Elective surgeries, such as spaying and neutering, are important not only to control the pet over population but also to make life easier for both you and your pet. All our patients are monitored very carefully using equipment to measure respiration rate, heart rate, blood pressure and oxygenation levels. A registered animal health technician is assigned to each patient and monitors them very closely. In conjunction with a thorough pre-anesthetic assessment, we’re able to reduce any risks inherent with surgery. We want your pet to be as comfortable as possible. So, we make sure that pain is addressed before, during, and after each procedure. We use heating blankets during surgery and recovery to keep your pet warm. We know it can be inconvenient to have to travel to find specialist care. So for complex cases, we host specialist animal surgeons at our clinic.